The Seldovia Rowing Club is South Central Alaska’s original bed and breakfast establishment. It all began in 1980 when former teacher, Susan Mumma decided to create a new and original business in Seldovia. It has operated continually since then, serving an elegant breakfast and providing a comfortable stay always. Susan Mumma is an artist and musician these days. She enjoys a quiet row and good company. Susan lives year around in her home on the slough with her dog Archie and cat Angie. Please stop by to say “Hello”. From an article by Charity Winters in the Seldovia Gazette. 2005Susan Mumma is one who has dedicated her life to the arts in many ways. 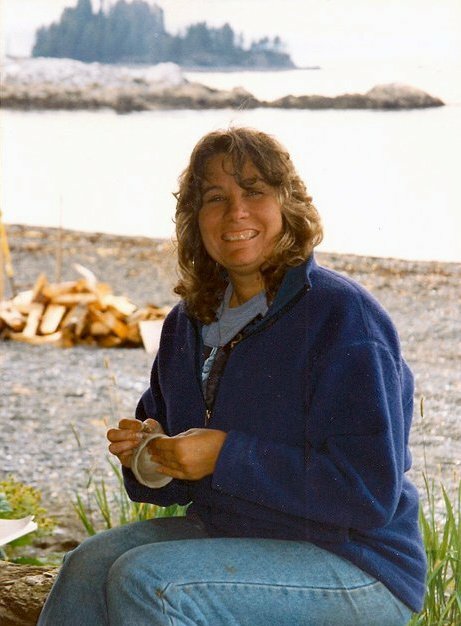 Not only does she pursue them in her own time through the guitar and watercolor paintings, she once taught art and music at Susan B. English and has worked to bring music and art to Seldovia through the Seldovia Arts Council.Susan first came to Alaska on a trip with her family in the 1970’s. She liked it so much that she pursued a teaching job in Kenai and landed a permanent substitute position for one year. She then moved on to Cooper Landing for 3 years. An environmental education trip took her down to Seldovia. Susan decided it was the place for her! The following year she got a job at SBE and taught “everything from soup to nuts” except for math. She recalls her teaching days with a lot of fondness. With her double masters degree in art and education from the University of Oregon, Susan enjoys working with the creatively gifted and talented. Kindergarten was her favorite grade to teach just because “you can do it all!”Now retired from teaching since 1996, Susan spends most of her time and energy as the chairperson for the Seldovia Arts Council. Her initial goal when it began in 1980 was to provide a way for people of all ages to be able to enjoy the musical culture of their community and it’s members. Susan would like to see more of a move to encouraging local artists to exhibit their talent, but in the meantime, the Council has done a lot to bring musicians and artists from all over the world to our little spot on the globe. Since 1999, the Seldovia Arts Council has worked on over 100 different projects ranging from concerts to workshops for both the community and the school. Their biggest event is the Summer Solstice Festival, which has been held annually for the past 12 years. Another large part of Susan’s life for the past 30 years has been the Seldovia Rowing Club. Originally a duplex home set right on the old boardwalk, Susan bought the building in 1978. She admits with a chuckle that it was sort of “an unusual thing for a 23-year-old single woman to do”. Her initial thoughts were to turn the building into a deli or a coffeehouse, providing live musical entertainment. But in 1980, the Seldovia Rowing Club opened up as the very first bed and breakfast in South Central Alaska. She had a neat story for me when I asked about its rather unusual name. Growing up in the San Diego area, Susan and her parents used to visit a famous rowing club on San Diego Bay called the San Diego Rowing Club. The building was similar to Susan’s bed and breakfast – set up on stilts right over the water. Susan had often told her parents that she wanted to own a building just like it one day. When she opened the Seldovia Rowing Club, her parents sent her a miniature version of the rowing club, reminding her of her vision years ago. For a time, Susan displayed her work in the upstairs of her bed and breakfast, calling it the Stairway Gallery. The gallery now serves as the Seldovia Arts Council office, although Susan’s beautiful paintings still cover the walls. Susan also uses the Rowing Club to house her Crazy Crow productions in the summer. Twice a month she invites musicians to play in the downstairs living area and the audience crowds into the cozy little room to enjoy a small concert. I guess I’ve done a bit of advocacy for the Arts!!! Susan holds a Master’s Degree in Education from the University of Oregon, specializing in the Education of the Gifted and Talented. Susan has been an Visual Arts Educator and Drama coach at Susan B. English School for 23 years before retiring in 1996. She was the Alaskan President of the Alaska Arts in Education Organization , Conference Co-Ordinator for two years and the Alaskan delegate to the National Art Educator’s Association. Before retiring in 1996 from her teaching career, she encouraged hundreds of young artists and drama students, some of which have become professional artists. She has been an artist in her own Stairway Gallery and an originator/ participant in Synergy Art co-op in Seldovia which ran for 13 years. Since 1999 she has been either the volunteer Chairman or the Executive Director of the Seldovia Arts Council, spearheading arts in Seldovia. She was Chairman of the Seldovia Chamber of Commerce. She created the Seldovia Summer Solstice Music Festival which has been running for twelve successful years and has become a major event for the community. She has offered her Crazy Crow House Concerts for over six years, sponsoring emerging musicians. She has staged hundreds of shows, written dozens of successful grants for her community, including Alaska State Council on the Arts Community Arts Development Grants, and Westaf Touring Arts Grants. She has housed hundreds of artists in her Bed and Breakfast, the Seldovia Rowing Club, the first bed and breakfast established in Alaska in 1980. She has been a panel presenter at Arts Northwest regarding touring in rural Alaska. She was an original board member of the FAR-west Folk Alliance. For a small town girl she has been a major patron of the arts on the Kenai Peninsula. Seldovia is a small remote town 20 air miles from the road system and to have participated in all of these national and state-wide activities has been a labor of love for the arts for Susan for over thirty years. Susan Mumma, of the Seldovia Arts Council; Renda Horn, from the Bunnell Street Gallery in Homer;and Sue Ingels, 6th Grade teacher at Paul Banks Elementary School in Homer acted as delegates to the first meeting of the newly formed Institute for Education and the Arts in Washington D.C., October, 16-20, 2002. The Homer/Seldovia area was chosen for its involvement in the arts and the delegates were chosen as leaders in arts advocacy for the area by organizers Ron Stowe and Donna Powers. Copyright © 2006 Seldovia.com, Inc. and Seldovia Gazette. All rights reserved. The Seldovia Gazette is published weekly by Seldovia.com, Inc. Contents of this publication may not be used or reproduced, in whole or in part, in any form or manner without the express written permission of Seldovia.com, Inc. Click here for additional details. Brings back beautiful memories from long ago. My husband and I stayed here on our anniversary in July, 1992. One of our favorite B&B’s ever.